Once again, choosing an eating destination after Friday hockey can be somewhat of a challenge. You see, we have people on the team that live in different parts of the GVRD. Hence, we need to generally find centrally located destinations. Not too difficult right? Well, tack onto the fact that we need to find places that close late as well makes it tricky. This week, it was made even trickier since Gadget Girl wanted to find a place that would be close to Ketchup's house. She had given Ketchup a ride to the game and needed to drop her off at home before we met up. That further narrowed our searc h for late night eats. 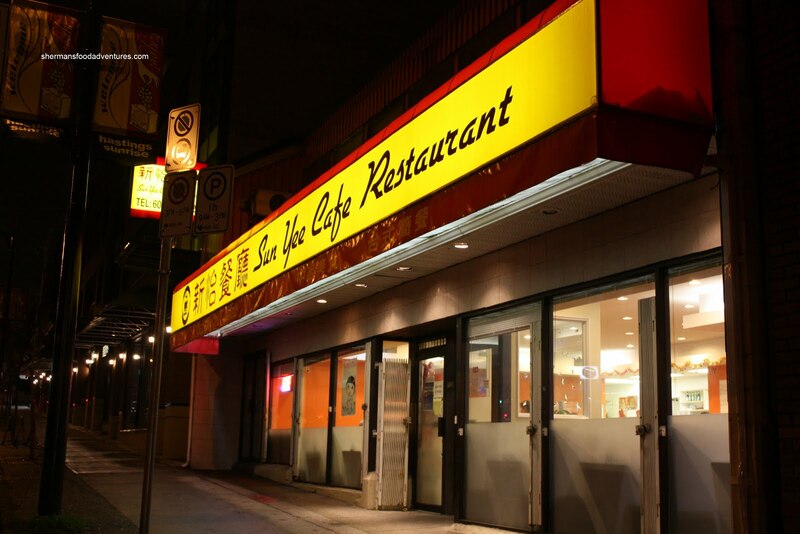 After some negotiations, we settled on Sun Yee Cafe. It seemed to satisfy all the criteria and no one objected. It's a tough job finding an agreed place to eat! Anyways, I've been curious about this place for quite awhile since I drive by it every time I go for late night Wednesday hockey. From the outside, Sun Yee is very hard to miss. It has got the classic bright yellow Asian awning. 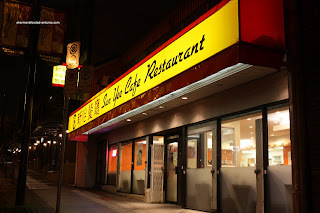 To me, it looks like any other Chinese restaurant. Not so fast. It is actually a Hong Kong-style cafe complete with late night specials which include a beverage. Being the greedy people that we are, Boss Woman and I shared 3 dishes. 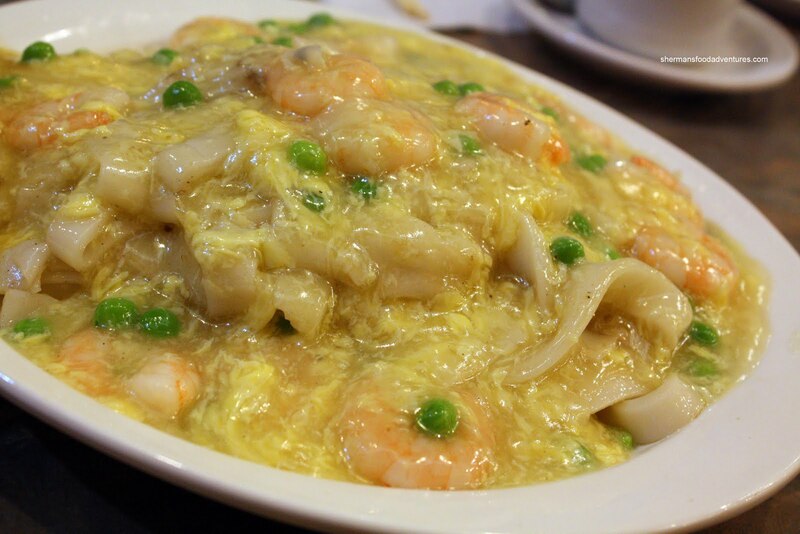 We started with her favourite Scrambled Eggs & Shrimp on flat rice noodles. All the individual components of this dish were cooked correctly from the slightly chewy noodles to the crunchy shrimp. Despite the nice appearance of the dish itself, it was sorely lacking salt. 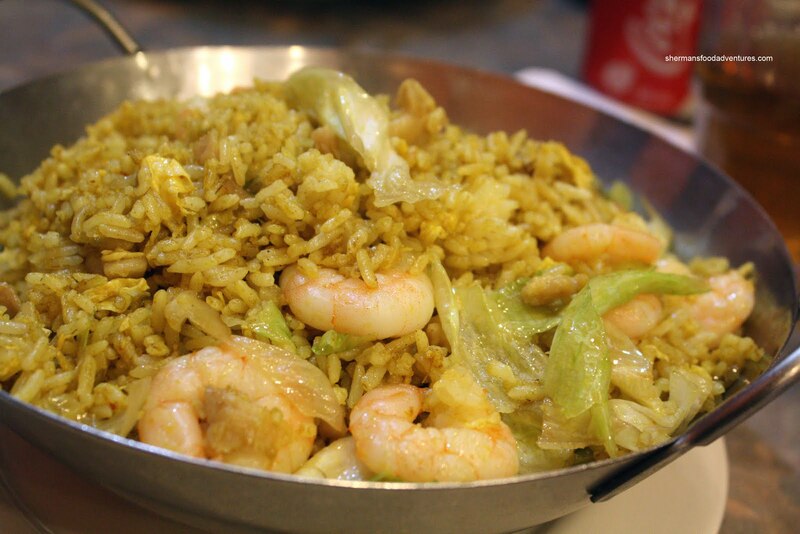 Our second dish was the XO Seafood Fried Rice. The XO represents a sauce consisting normally of chili oil, dried scallops, garlic, dried shrimp and sometimes Virginia ham. Hence, the rice is fried with the sauce and seafood. We liked the chewiness of the rice and the decent amount of seafood. 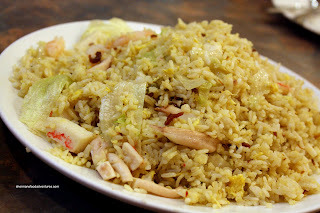 There was a some kick from the XO sauce; yet the rice was also lacking a bit of salt. Our last dish was the Taiwanese Beef Noodle. I know, I know... 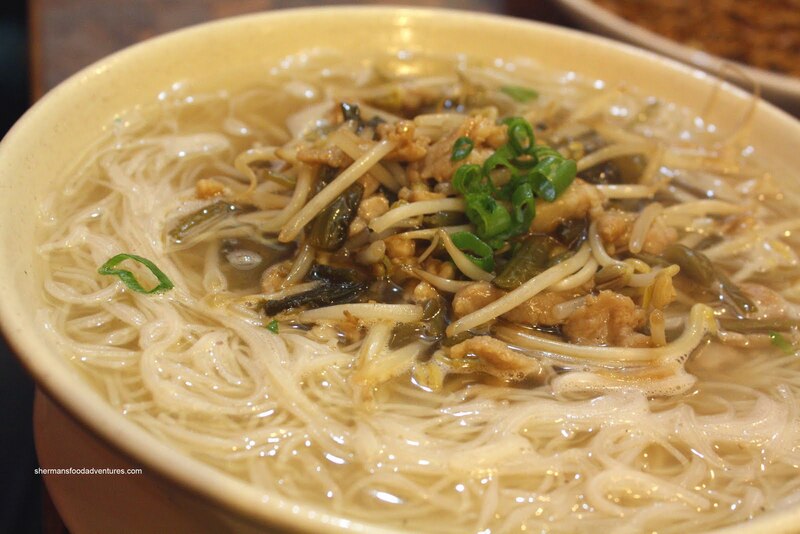 Ordering a Taiwanese dish in a Hong Kong-style cafe is asking for it. And you know what? We deserved what we got. I bet Miss Y is laughing at me somewhere... You see, I give her a hard time for ordering stuff that a restaurant is not known for. As you can see, the broth was really light in colour. That was indicative of the taste as well. There was none. Bland, lacking depth, colour and salt, the bowl of noodles didn't taste like anything. In fact, the preserved veggies couldn't even save it. On the plus side, the noodles were al dente albeit too thick. Also, there was plenty of tender beef shank. 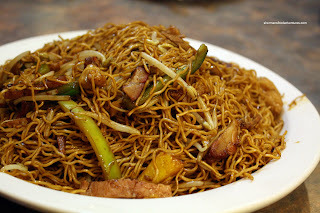 Gordo, who was less ambitious than we were, only had the smaller version of the Soy Fried Noodles. I gave this one a try and it had very good "wok hay" exhibiting good caramelization from the high heat. No shortage of flavour in this one. 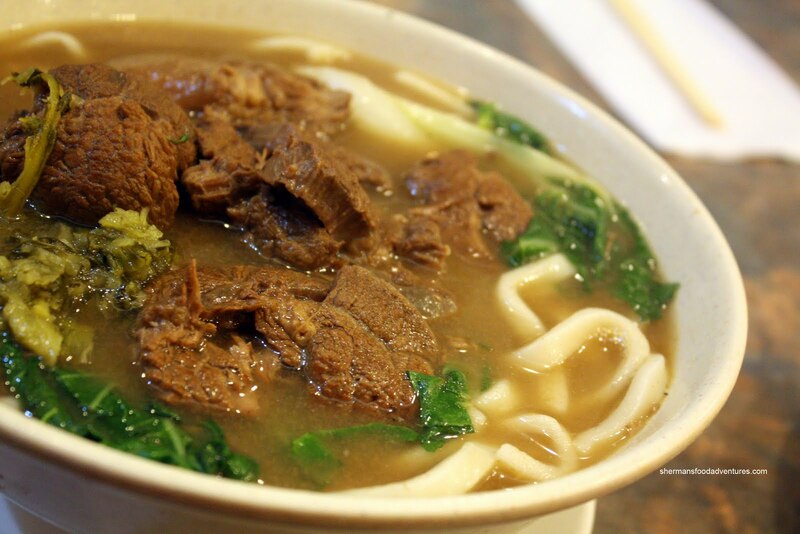 The noodles were still chewy and it was only moderately oily. Milhouse deviated from his usual Salted Fish and Chicken Fried Rice and ended up with the House Special Chow Mein. 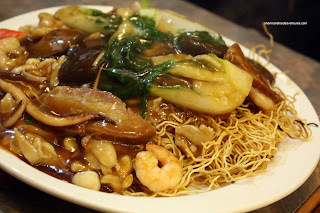 It usually consists of everything but the kitchen sink such as squid, BBQ pork, mushrooms, chicken, shrimp and bak choy. The noodles were crisp, ingredients were plentiful and there was just enough sauce. A decent version. He tried to offer me some; but honestly, I could only eat so much. Yes, I do have my limits! Lionel Hutz and Trudy-Frutti arrived much later since he drove all the way back home before meeting up with us. Home is actually somewhere around Kits. Apparently he had to drop off is hockey equipment first... Really? Hm... or is that a code word for something? I'm not going to speculate much more... So, when he did arrive, he ordered the Fried Rice with Curry Prawns and Chicken. There was definitely a good amount of properly cooked shrimp, not sure if they could qualify as prawns necessarily. He thought the rice had a good amount of flavour and curry which was only mildly spicy. Ginseng went for something that was on the regular menu. I didn't even know it was an option because we were too busy looking at the late night menu. Trudy-Frutti decided on the Preserved Vegetable and Pork with Rice N oodles in soup. It didn't look like much; but she remarked it was quite flavourful, especially when the stir-fried ingredients mixed with the soup. The noodles were just right with a bit of chew. 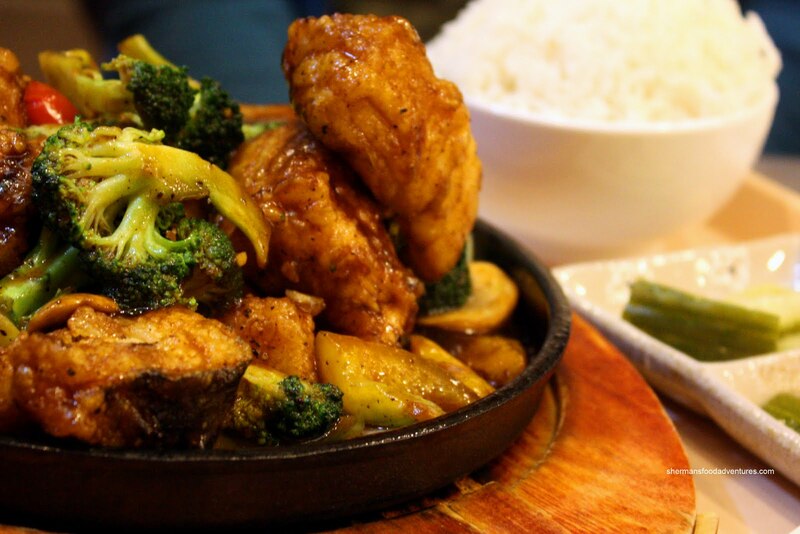 Ordering off the regular menu, Ginseng went for the Sizzling Black Cod Hot Plate. It came as a "Taiwanese"-like combo with rice and pickled veggies. I was thoroughly impressed with the amount of fish there was on the plate. Ginseng remarked that the fish was moist and there was good amount of seasoning as well. I asked if it was oily s ince it did exhibit a nice sheen and she thought it wasn't too bad. In terms of the food overall, it really wasn't too bad. Some items worked better than others, which is quite normal for a restaurant. However, the real draw here are the prices. They are very reasonable for the amount of food you get. Considering the fact it is open late makes it extra attractive since it gives an alternative to the wonton noodle joints nearby. Not great food, just okay food for a great price. True, I much prefer under seasoned than over. However, if more than a few dishes suffer from this problem, then there is a problem. Food should not be under or over seasoned.